Struggling to write. Manual dexterity poor, numbness in fingertips and swollen hands. Knees painful when sitting. Feet swollen, ankles swollen and painful, going up stairs is worst. Sleep deprived. Sadness to have stopped before the end, proud of 1350 km. Tears and embraces still with me. 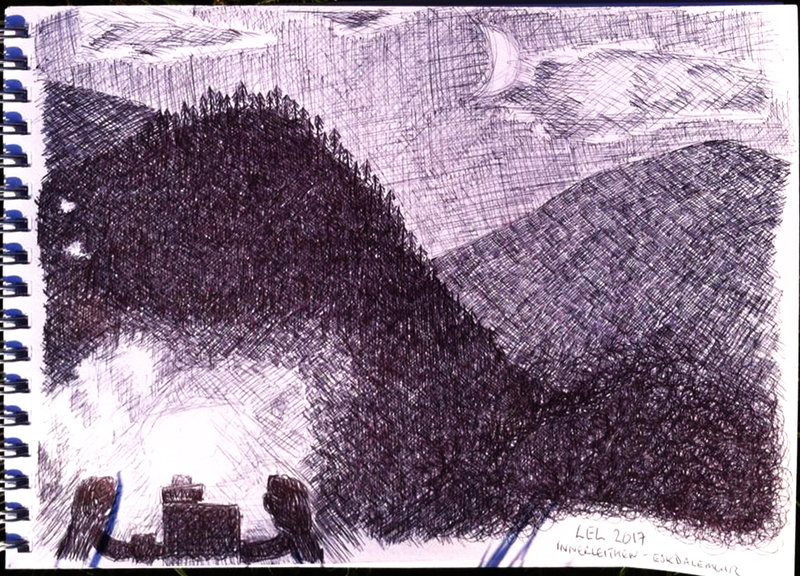 Landscapes, weather, experiences…trying to fit them together to make a coherent story in my head. In other words I feel alive. It really has been, and I hope continues to be, a life-changing experience. At the start, to feel as entitled to be there as anyone else. So many different nationalities, strategies, bikes, speeds, luggage…but united. The week leading up to LEL was one of the hardest in my life…it seems flippant to say that from this more comfortable position but it really felt like that. 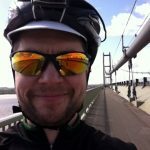 I’d come off anti-depressants a few months previously after around 5 years; at the time I was feeling ok and didn’t want to be taking medication for ever. Slowly I started to feel different. First the sudden unexpected choke of threatened tears where they hadn’t been before. Then the slow rising tide of depression, taking motivation, time, joy, ambition and enthusiasm, including for LEL. I was existing, but not living. 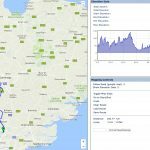 I’d had quite a good plan of training rides, made in the enthusiasm of January, which should have taken me up to a 600 km, if not two. A few were missed due to unavoidable life stuff (including a brick through my living room window while I was en route to what should have been my first 300 km). I made myself do rides I had planned but more and more was finding anxiety being surrounded by others and tried to avoid people as much as I could. Please don’t speak to me, don’t make me engage, don’t force me to flick the heavy switch that smiles. A 400 km completed brought little joy. 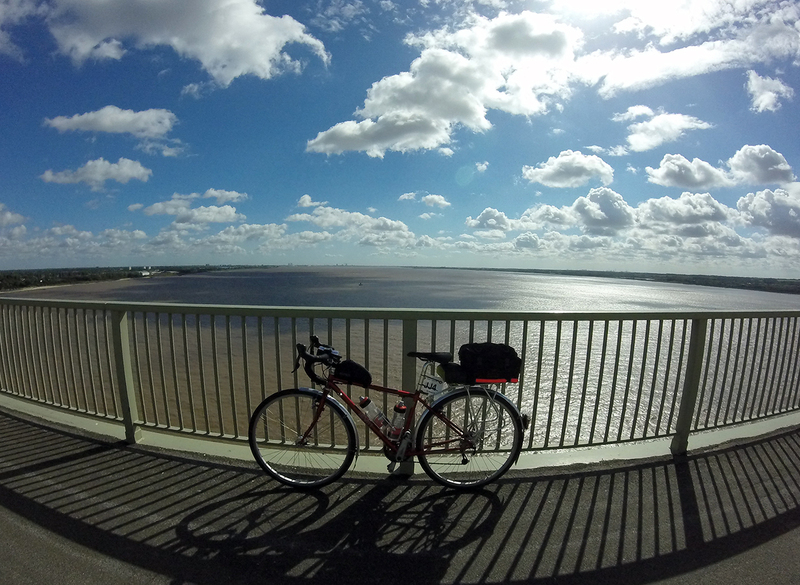 I arrived lantern rouge with 10 mins to spare having had a puncture and being lost a couple of times in towns. I finished in a bit of a bad mood I think, with no time to sleep before the hall HQ was closing and I had to leave for a train home. That ride was a lone battle through the night, my first to see light go and dawn come. I felt so slow during the night stage, but there was nothing other to do than to keep going. So easily spooked by shadows. Eventually daylight and a service station, a few words with a group of three who’d been a bit ahead of me the whole time, then they were gone again. 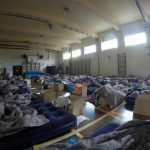 The 600 km – again, into the hall and pick up my brevet card, lay out the bed, then go away and hide to be alone until it’s a suitable time to sleep. The ride starts and people settle. I’m alone but plenty of others visible, and I being to relax. This brings on a migraine (my usual trigger is the relief of stress) which causes me to pack at 100 km, being unable to see properly. One more chance, another 600 km; this one I’ve spent a bit on travel and accommodation for. Again no great desire or motivation, I just make myself get to the start because I have to. This is x-rated and I’m inexperienced. I’ve got a bivvy bag on my rack because I knew I wouldn’t have time to make proper use of a Travelodge along the way. 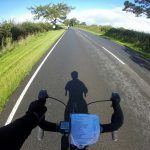 Devon, Somerset, Bath, Gloucestershire, Oxfordshire…crossing hills under a June sun which is logically beautiful but in my state of mind that was alll it was, I wasn’t enjoying it and had no passion. I fixed a broken mudguard with duck tape and cursed Oxfordshire Council’s road resurfacing programme. Discomfort, tiredness…never quit until you’ve had a cup of tea and a sit down I’ve been told. A coke and a park bench on a nice village green at 220 km would do. I could pack. I COULD pack. I don’t have to do this. If I pack it’ll be the end for LEL. I could volunteer. Ok, I’ve given up LEL. A strange calmness comes over me: regret and release. A few days later; rational brain. I’ve got my train tickets and camping in Loughton all sorted and paid for. No one else can benefit from my place at this late stage. I spend a lot of time reading threads on yacf. I’d sent Peter a message when I packed the 600 km and he does a great job by not encouraging me to volunteer. I persuade myself to start, and this causes lots of stress as I consider the bike maintenance required; new mudguards (I really can’t start LEL with duck tape holding everything together), brake blocks, swapping front/rear tyres which of course involves valve damage and a flat, last minute saddle change, running out of time to fit new cables…yes my headset needs attention…this takes hours and hours and I get frustrated (as always) by the slow progress of this amateur mechanic. Also up against time preparing route sheets, etc. Meanwhile work is a never-ending stream of emails and requests, I manage to spend an afternoon trying to get on top of things but they are coming in faster than I can reply to, never mind actually attend to. Management are ineffectual and I feel alone. See my GP and discuss pros and cons of going back on medication – it would be long term and I don’t want that. Investigate other options, and not for the first time I am struck by the gap between crisis services and talking therapies with a 3 month wait. Nothing for the in-between space where I am. Hate being at work but I don’t want to be signed off, I know that wouldn’t really help. 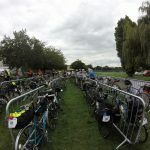 Even in these last few days, as I see photos on Facebook of riders coming to London from all over the world, I am not sure whether I’ll actually make it to the start. 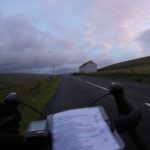 I am only just getting myself out of bed and into work, how am I going to motivate myself to keep going in the dark, in the rain, uphill, in the middle of nowhere? I get through that last week, though not without a recurrence of self-harm. I’d been ‘clean’ over two years. It provides about 24 hours of stillness. At some point I seem to make my mind up; yes, I will travel to Loughton. 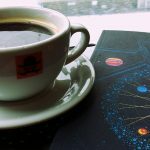 I want to experience the atmosphere, and I actually start looking forward to registration. And then I’m there. I see a few people I know but avoid speaking to them. 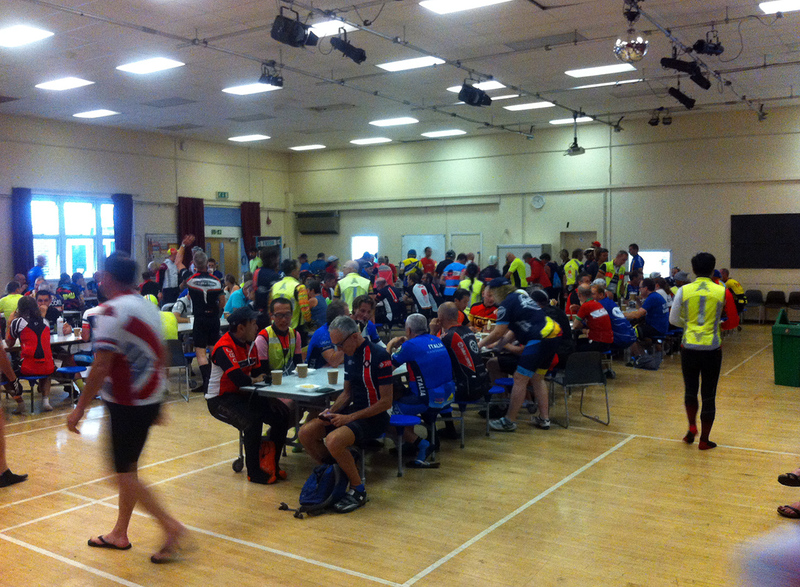 At the start I see and eventually speak to a couple of riders I know; we’ve done several of the same build-up rides. I watch several starts. A bloke in civvies speaks to me, he has just come down to wish people well and see them off, he doesn’t know anyone in particular. This is humbling. As my start time approaches I send a hurried email to my family with the tracking link. They know I’m doing this but not much about it. I’ve deliberately not shared the tracking link before now, not mentioned that I’m doing LEL on Facebook, not ordered a jersey, not ordered a yacf nameplate…it takes until registration for me to feel that I’m actually allowed to be here; eventually it seems that we are all in this together. The wait. 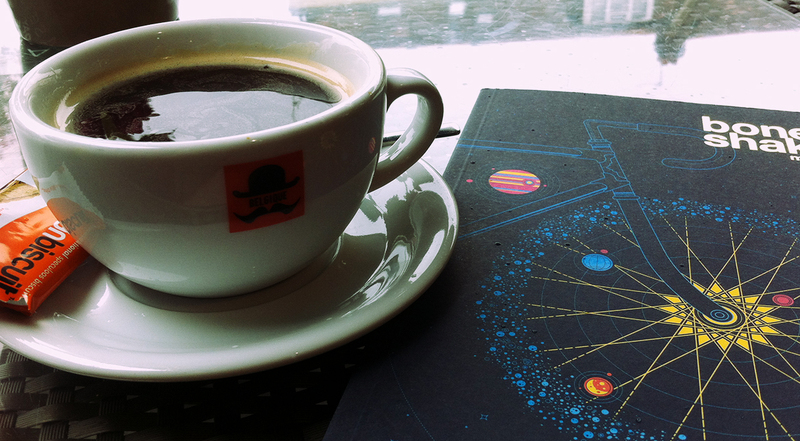 Hours yesterday after registration, first in a coffee shop in Theydon Bois then later, when the rain had properly set in, in the tent, reading a newspaper until it was a respectable bed time. A thunderstorm in the night. No need to get up early but awake and no desire to lie in after about 7.30 am. 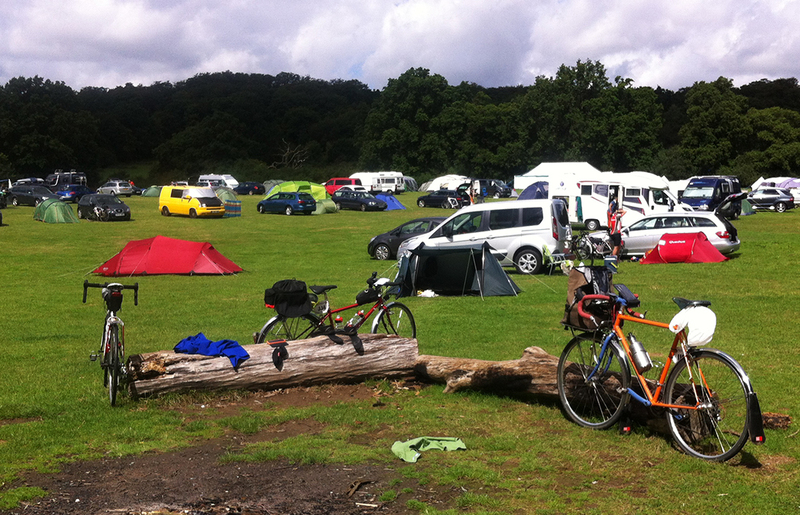 Some riders were on their way by now, the tent and bike next to me already gone. 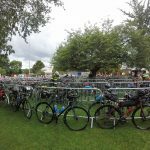 Now, after a morning trip to Loughton to find a Costa (reliably open on Sunday mornings), which was nice as I saw lots of riders heading to the start, I’m sitting in the tent wondering whether it’s too early for me to go yet. Everything is ready, my towel has even dried after a shower, all that remains is the application of Conotrane. Two German JJ riders opposite (same start group as me) have just left although they are still in civvies so not sure where they are going to. It’s sunny and breezy, a some clouds. Checking out the bikes: so far one Brompton, another Hewitt, recumbents, only one tandem as yet (although saw a trike this morning), an old Raleigh with a large plastic water bottle with a tube up to the bars, French one with gorgeous lugs, Californian Carbon with couplings…watching the groups starting, still far enough away from my start to be too nervous so maybe should eat before appetite is lost. I can’t remember much about the first stage. The starting group fragmented a little but I think a few of us rode pretty much together most of the way. I remember a French chap in front, and a Japansese guy just behind my wheel quite a lot. Somewhere along here we crossed the Greenwich Meridian which I think is marked by a sign, but I missed it. The weather was mostly good. I came into the control just behind this fully-faired recumbent, which was entertaining just from the reactions of spectators. 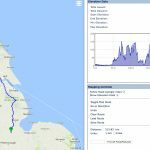 Got to Spalding earlier than expected, the last stage was fast with a tailwind, and it turned out to be a nice evening after a bit of a downpour on the previous leg [Ed: these notes were made at the time, I have no recollection of this now!]. Through Crowland with its curious three-legged bridge; I didn’t stop to take a photo because it was inhabited by 16 year olds drinking cider (or whatever 16 year olds drink these days) and I’m easily intimidated. I planned to sleep here and did so, figuring the beds would be full at Louth. I got up at 2.30 to leave at 3.00. 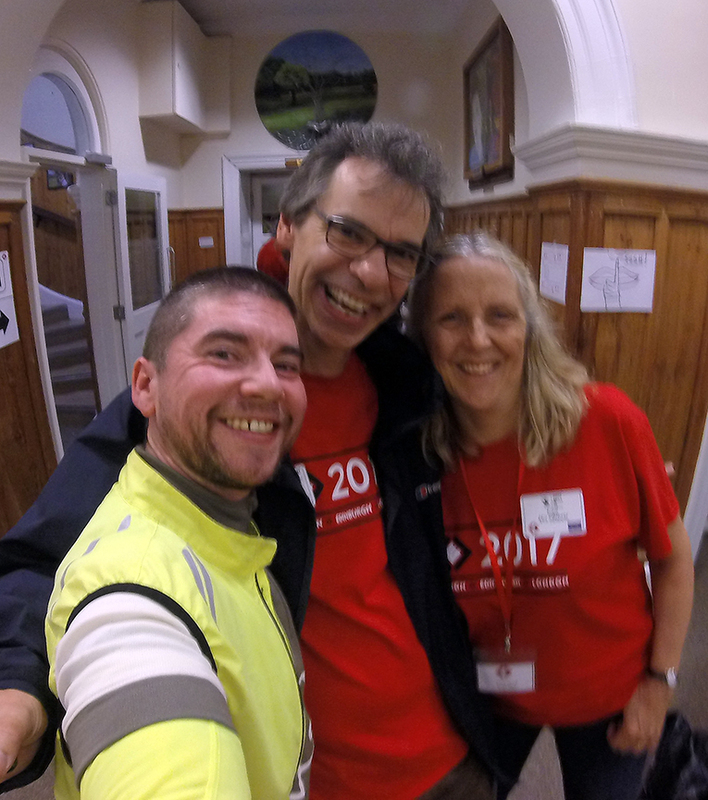 I met Rickie in the dining hall, he’d already had the disaster of a sheared pedal axle, had managed to get home and get either a replacement bike or axle (not clear which) and get back on track. Pretty sure I’d have taken any excuse to quit, where some people take any opportunity not to. 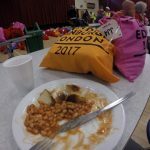 Food in the evening wasn’t wonderful, but the volunteers were, and there were breakfasts. Plenty of bed space and it was well organised. My first experience of being woken and I surprised myself by being ‘happy’ to get straight up and get on with it. This was a nice morning’s ride and a good time to start out, seeing the light come into the day. This type of landscape is unfamiliar; the map shows no contours and roads and rivers travel in straight lines and take 90° turns. For the only time on the ride this section was deserted, I only met one other rider and that was because he’d been sent back on himself by his Garmin. More owls than cyclists. Looked forward to a second breakfast at Louth. Got one of maybe three remaining portions of past-its-best porridge, and black tea because they’d run out of milk. This was the only time I was disappointed by a control; I’ve since read about issues with the external contractor. 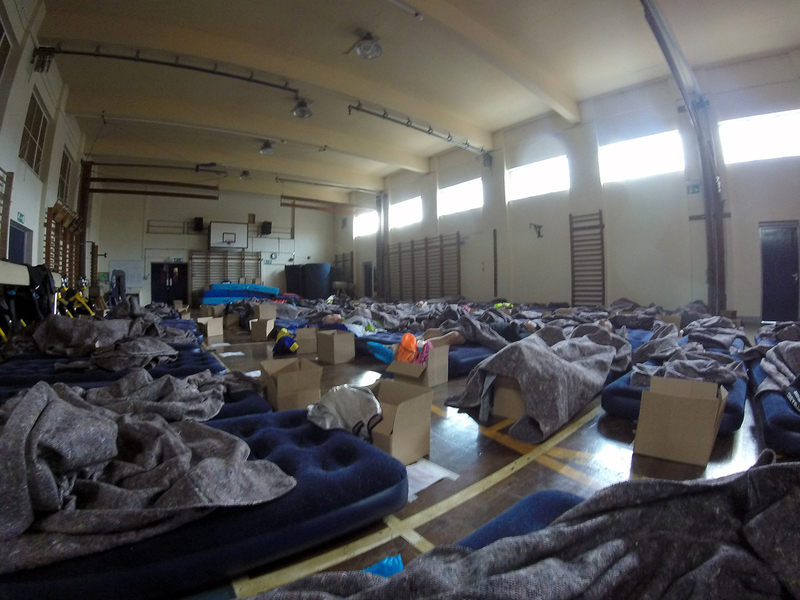 There were a few folk sleeping on the floor in the dining hall, so presumably all the beds were full. The weather forecast was on display on wall-mounted monitors – nice touch – and it looked good. 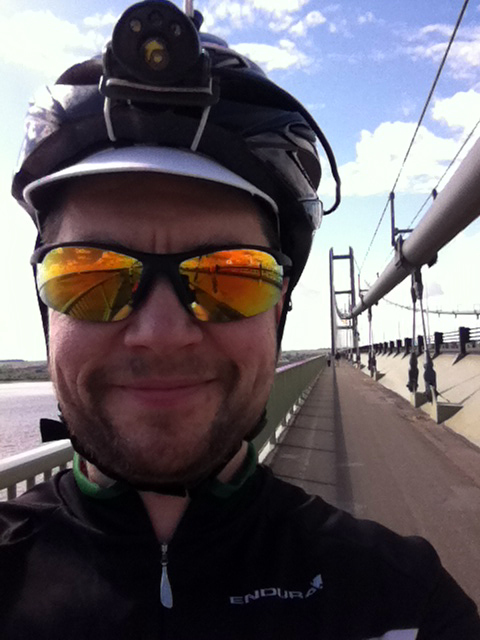 The Humber Bridge was the highlight of this section. I felt like I was missing a line or two on the route sheet, or I took a wrong turning coming off the bridge, but little-recumbent-guy (who I saw quite a lot of over this day or two) showed me the way. This photo is me doing my best Arnold Rimmer face. Before the bridge there were Wolds. I dislike Wolds. 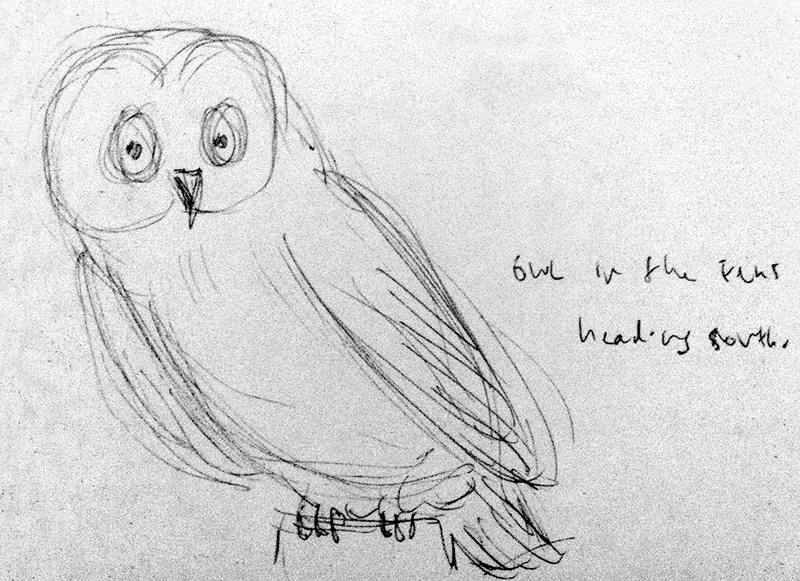 Notes I made on arrival at Thirsk: Feet are uncomfortable but not as bad as the hot thing I had on the Exe-Buzzard. Thought I’d try some ibuprofen (and perhaps it will help with everything else). Saddle sores seem present when I clean but they are actually not too bad on the bike. Wipes and Conotrane at every control. The mechanics seem busy, just saw someone come in with an armful of tyres. On this stage I met a guy waiting on a verge whose frame had cracked. I guess you can be prepared for the likely, but carrying a spare frame is beyond even audax levels of self-sufficiency. There was some writing on the road here including ‘half way to Edinburgh’. Which I found very welcome, but also thought I might swear at it on the way back, if I got that far. 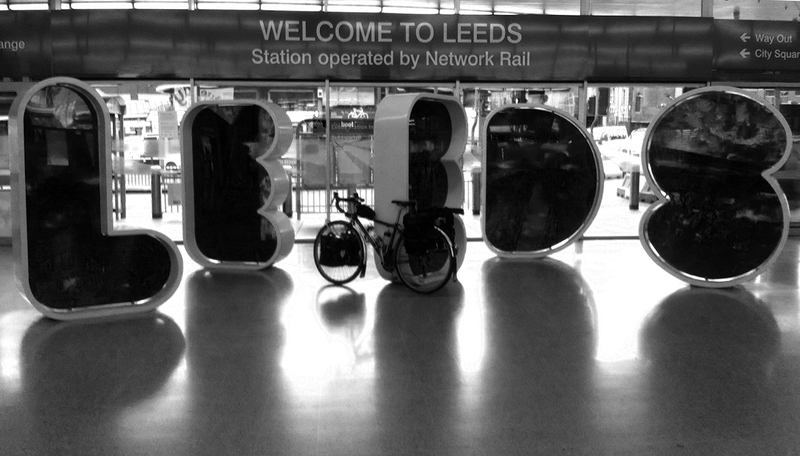 Either I’ve seen one of the first riders on the return journey or it was someone packing. 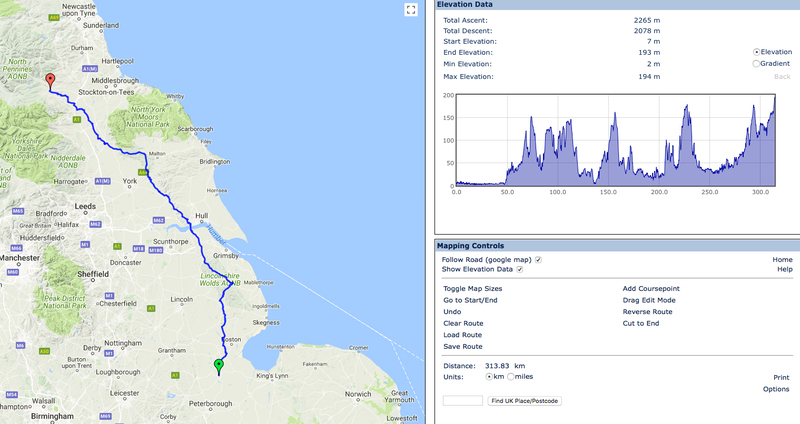 By Thirsk I’d ridden further than before. Didn’t really seem to register. I thought more of this would be familiar than it was, but nevertheless it was nice to go past Newby Wiske with memories of my first 300 km. 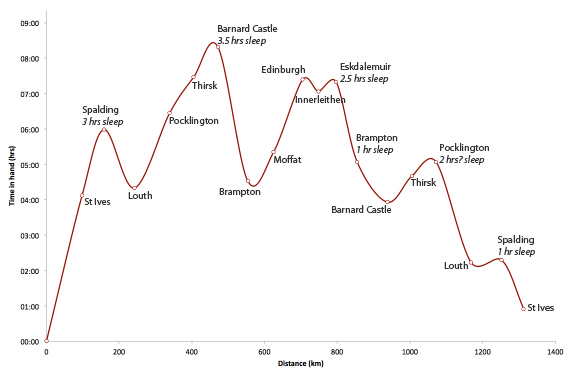 I rode quite a bit of this leg with Osian; nice chatting and it certainly helps the kms go by, though I find it impossible to concentrate on the route sheets at the same time. 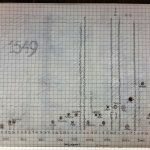 Osh’s knee was looking pretty bad and he had a chat with the control Doc (Barney had TLC you would never have imagined); of course medical advice on most complaints would be to stop, which no one wants to do. His plan involved quite different sleep stops than mine and he set off again, while I headed to the big sports hall for a few hours sleep. There was plenty of space here and I was given mattress on the far edge, next to some gym mats so I even had a nice surface to do a couple of yoga stretches on. I’ve done this when touring and it’s really nice to get your spine in a different position for a few minutes after being on the bike all day. On LEL I intended to do this before sleeping, I managed in Spalding (all-be-it without gym mats) and here but after that it went out of the window. I had looked forward to seeing controllers Erica and Peter and daughter Vic at Barney, who I met when volunteering on WCW (Windsor-Chester-Windsor) a couple of years back. Familiar faces and their welcome were heartwarming. I think son Jamie had the pleasure of waking me up next morning – it’s a brave job to be rousing sleeping randonneurs. I got on the road again about 3.30 am, a great time just as light was appearing. A lovely start, at first dark and undulating. Impressions of a beautiful valley but more light would be needed to fully appreciate it. Caught up with Union Jack tights-guy (another name I’ve forgotten, sorry) and chatted for a while. I arrived at a later control around the same time as he did, to hear a volunteer helping him with ‘this is Moffat and it’s Tuesday’. Pressed on over Yad Moss as colours came into the sky; I rather enjoyed this but don’t tell anyone. Enjoyed some free-wheeling down the other side, not before the rain started and riders coming passed stopped too, to don waterproofs. I rode with Maryjane from the Isle of Man for a while, also a lab tech and also riding a Hewitt; we arrived at Brampton together but I lost her in the bike park and didn’t see her again. I had a shower and a change of clothes from my drop bag; I probably spent too long here but a shower really does make you feel human again. I hadn’t thought about the changing rooms which were the typical UK school set-up which means no privacy; why are they like this when the rest of life isn’t? Happily under these circumstances I think most people would be a bit preoccupied with their own thoughts. There was a covered area to hang up wet stuff, I think some things were pegged up on the way north-bound in the hope they’d be dry coming south. Shout out to the volunteers here: a very patient german guy in the bag drop and the chap mopping the shower room. 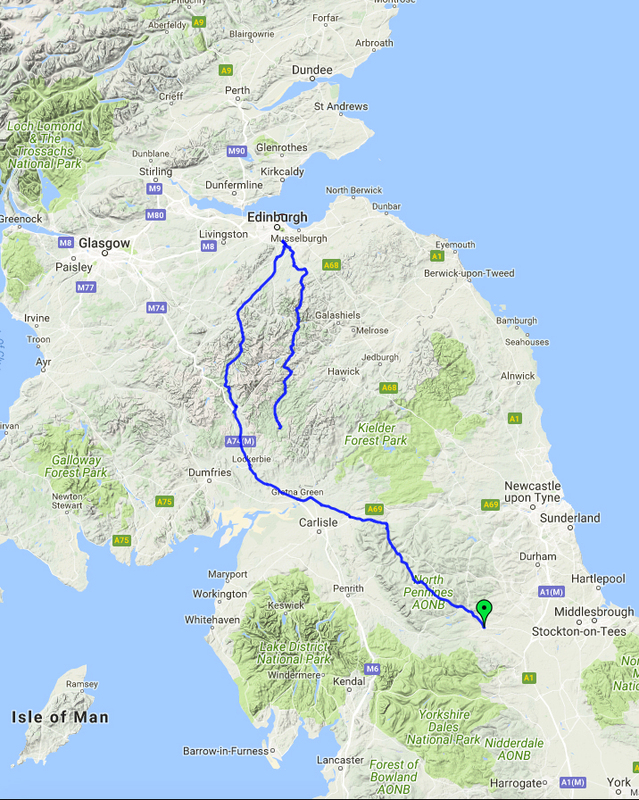 The direct road from Gretna to Moffat is soul-destroying; featureless apart from the road surface, which has too many features (I’ve done this on JoG and I’m also sort of local so I knew it was just a case of head down and keep pedalling). 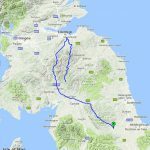 I stopped at Lockerbie Tesco for some emergency food that I thought I might want later, and ibuprofen, which I had by now started taking two of at every control: I’d never done this before, and would only do so again on this kind of ride. A few others stopped here, including a German rider who offered me some chain oil. This was one thing I wasn’t too worried about as I’d put a new chain on and it was still luxuriating in the stuff it came in. Still, it’s probably the only time I’ll be offered lube by a german woman. 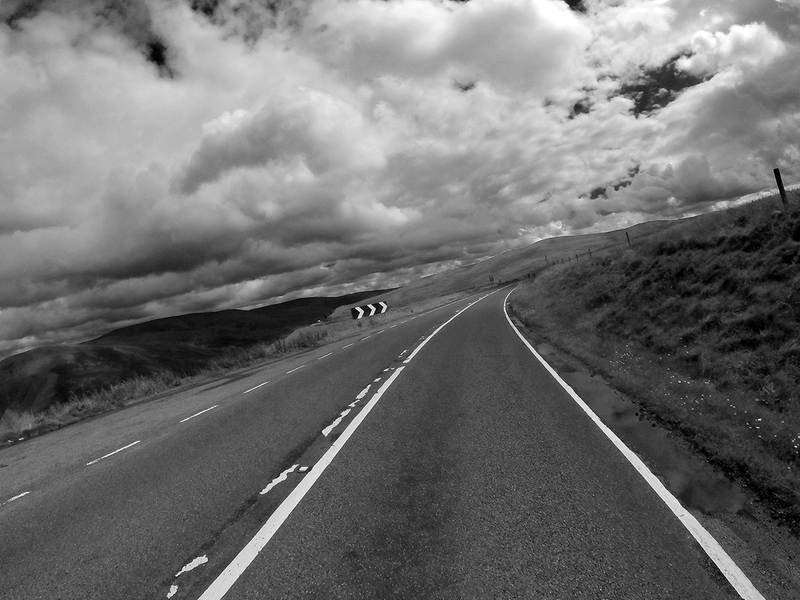 Riding this stretch of the A701 really was a childhood dream come true. 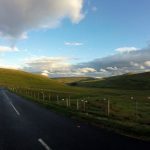 So often had I been driven (and latterly driven myself) up here and imagined bicycle adventures…I spent too long at university in St Andrews and home was just off this road some 10 miles south of Moffat, but I could never have entertained such long distance riding then. 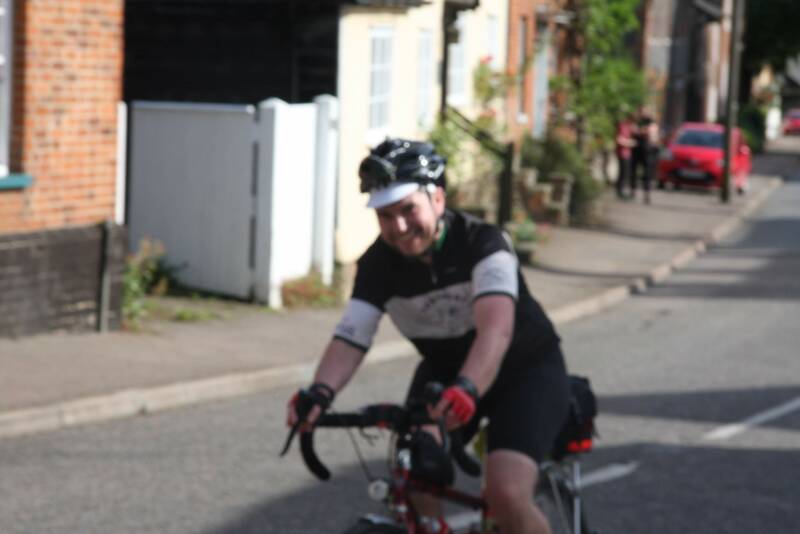 The first section was a bit unpleasant but after that I just settled in a lowish gear and took it easy, plodding away. The weather was nice at the top. It isn’t always of course; somewhere up here is a memorial to two postal workers who died after being caught in a blizzard. 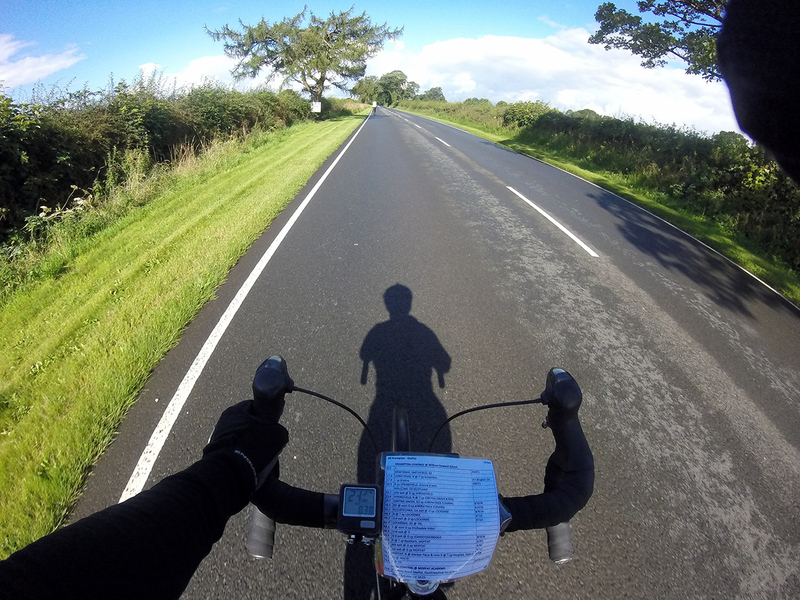 Then such a long freewheel I forgot that I could pedal for a while, until some folk sped past me. 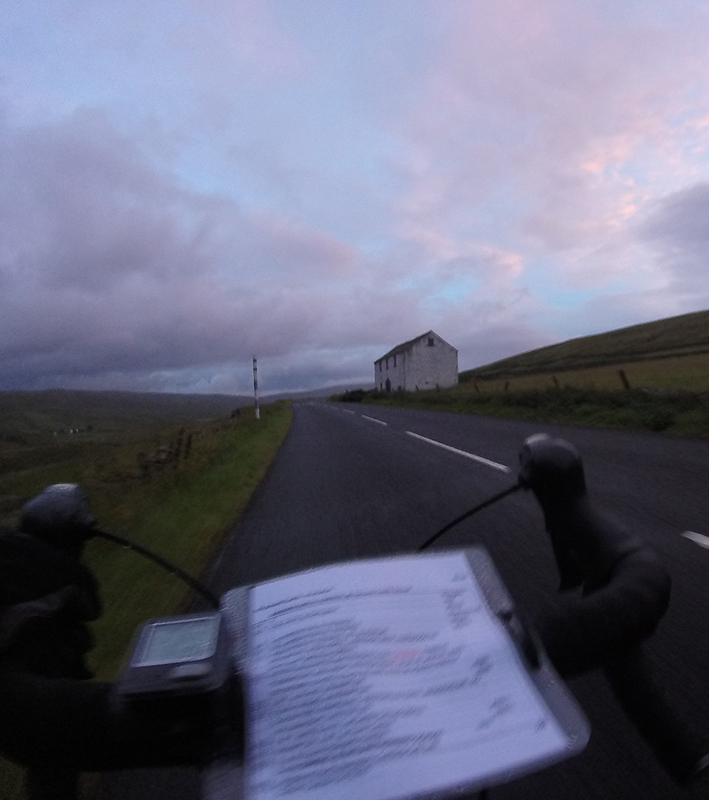 Then those familiar places; Broughton, Blyth Bridge, Romano Bridge…eventually a turn-off to new roads at Leadburn. Now the approaching rain was gaining on us. All day it had been on/off, short sharp showers which could be ‘ignored’, but it was clear that this one meant business. 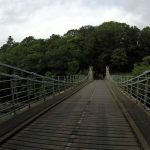 After some horrible road surfaces coming into Edinburgh the route took a cycle path where I followed one of the Elliptigo gang; I could see why he was wearing a helmet – all those overhanging branches. I was happy to see Raj leaving the control just as I arrived, he seemed be going well. Osian was here too and we ended up riding a bit of the next section together. Trikin’ Dave was on the desk when I checked in which was great as I’d hoped to see him, although we only had time for a few words. I tried to find him later before I left, but I think this coincided with him going out on a rescue mission for a rider who was down in the horrible rain. I was very hungry here and for the only time went back for seconds of pasta, then a muffin; that much would have made me feel sick elsewhere. 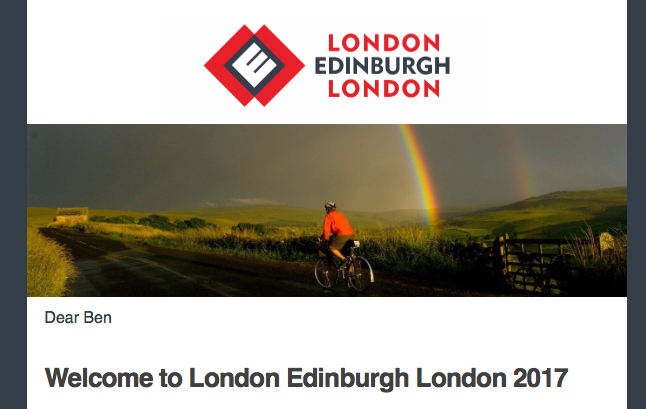 I don’t think I had any sense of celebration of reaching Edinburgh; just keep going. I loved this section. Deserted roads up and down valleys. We accidentally formed a Yorkshire group, with Osian, Nick (suffering but determined to finish LEL and achieve a Brevet 25,000 award, which I believe he did), and Jack and Patrick, both from Leeds. Nice chatting carried us up the climbs, eventually pee and jacket stops separated us. The Innerleithen control was lovely and in retrospect I should have stopped here for sleep; Osian did but it seemed a bit soon for me. Great to see Lucy McTaggart here after doing her weekend of rides not so long ago. The food here was some of the best. I forgot to buy mudguard stickers and missed getting a badge. 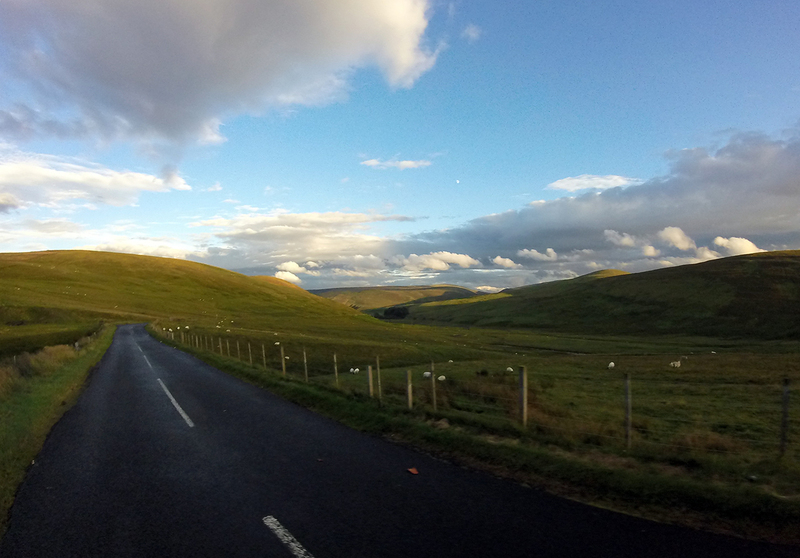 A twisty route out of Innerleithen as it got dark was followed by one of my highlights; riding through these hills as dusk turned to darkness; moon, stars and riders’ lights up ahead twinkling, and the silhouettes of hills. Going up was good, going down, with (as it felt) limited illumination, less so. I’m not sure if it’s my light or my confidence. But the second half of this stage I hated. 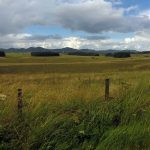 I was so alone by now, the only other person was an Aussie who came out of nowhere, speeding downhill just as I’d braked to avoid some cows who showed no sign of moving at all. He soon disappeared and I was alone again. I was staring to get a bit cold but was reluctant to stop as I was ‘nearly there’. 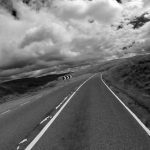 This was a section that brought back memories of a conversation on yacf on ‘the only time I thought I might die on an audax’ (2009 epic weather I think); here was a steep drop to a burn to the left on a very quiet road. Ok it was dark, but the weather was good now; I’d hate to be here in the circumstances that were described by others. Eventually the junction familiar from the Moffat Toffee appeared, and I was nearly at the control. 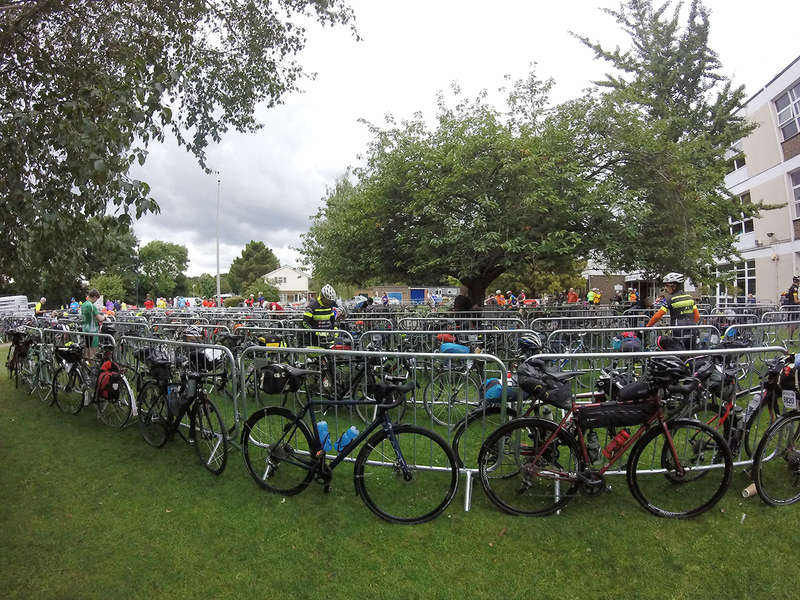 The sight of a bunch of bikes leaning against a hall – the control! No, I know it isn’t, because it isn’t the community centre…could the building have changed shape? I’m confused (and clearly tired). Then a Peter appeared and explained it was a dorm, the control was another 2 km down the road. 2 km! It seemed so far. Finally I got there and had some soup, then looked for somewhere to sleep. I knew there were only 30 beds here (although they’d got the extra ones in the hall down the road and they were all full), but the cafe floor was also pretty full so I tried to get some sleep sitting with my head on a table. That didn’t work. I was sitting looking bewildered when Chris Crossland (again! how did he get here?) came over and offered me an emergency camping mat (which I suspect may have been his own accommodation). There were no blankets left but the room was warm and I had my jumper on, but still had random shivers every so often. I asked to be woken at 4 am but didn’t really sleep and got myself up. 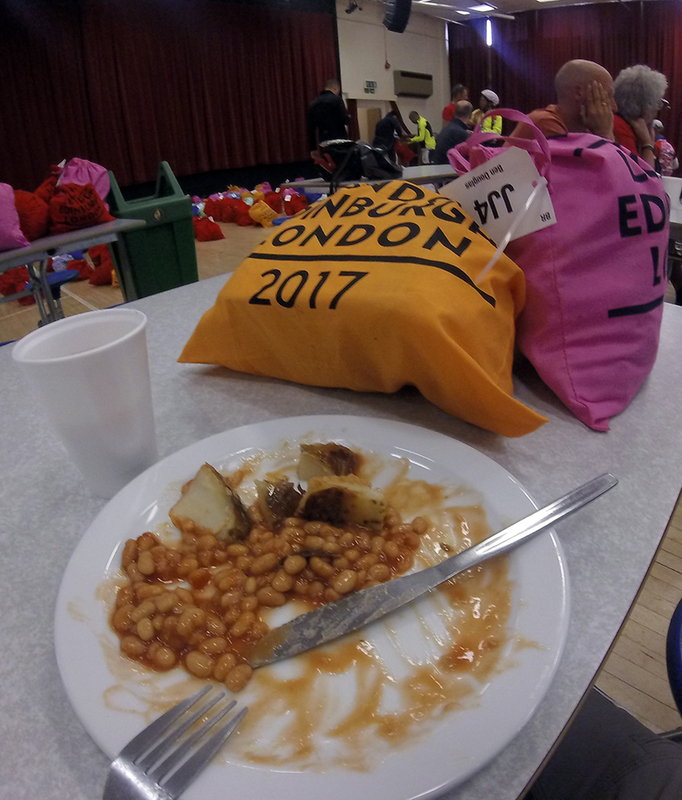 I think I ate some more, the cafe still looked like a disaster zone but the amazing local volunteers were still going. 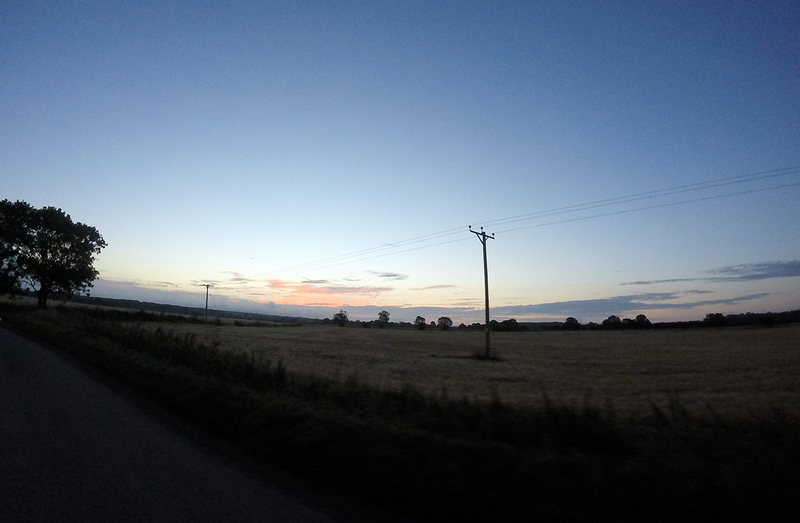 In the few minutes it took to faff outside before leaving the midges attacked, and I was glad to be moving again. 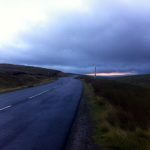 The route to Langholm was the same as on the Moffat Toffee, I remembered a climb but it was ok and warmed me up so I stopped to take a layer off. 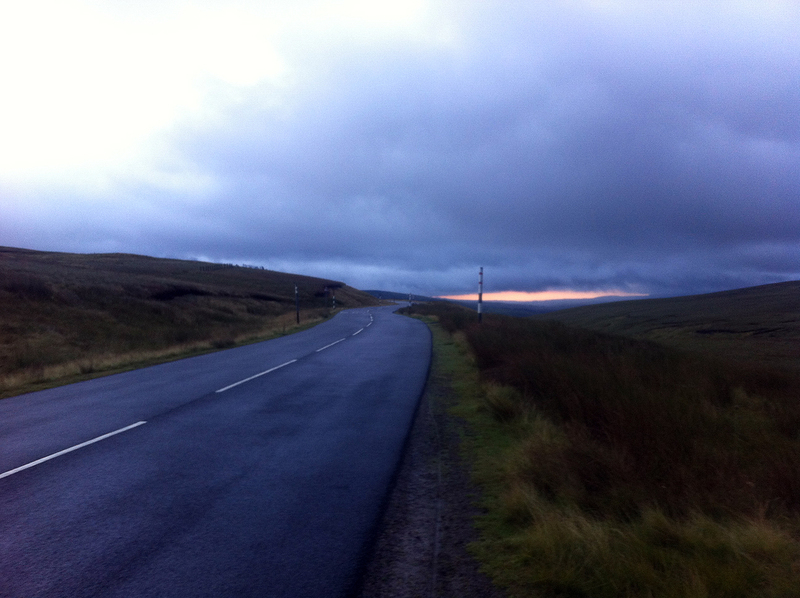 There were a few others on the road, and stopped in Langholm, but I rode alone. 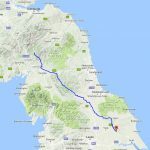 Shortly before Brampton the route joined back up with the northbound leg, near the border. I stopped in Longtown just as a garage was opening at 7 am for a can of coke. The woman running it had already dealt with many riders on the way up so she was fully aware of the lunacy of it all. 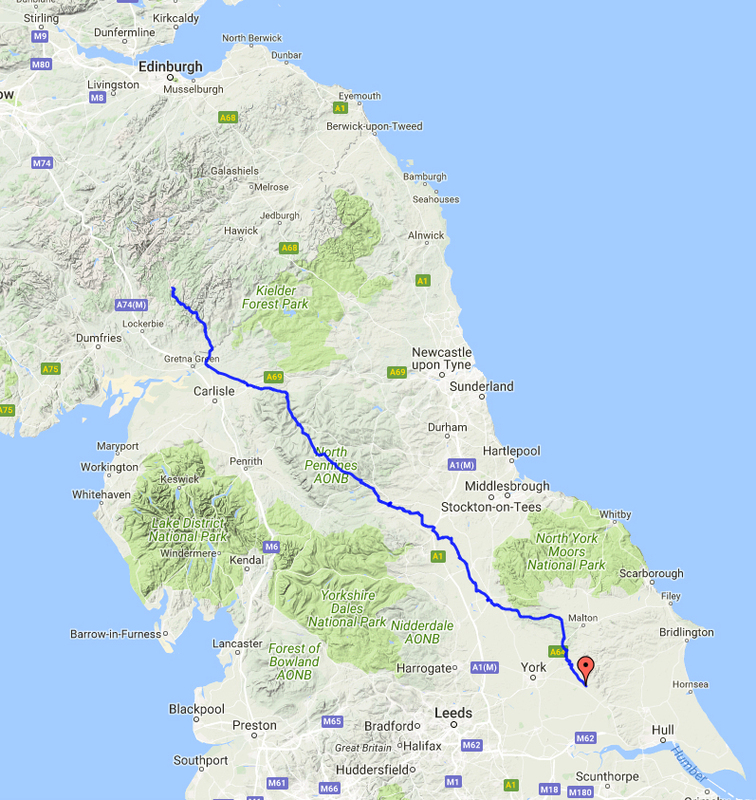 I was struck by her strong northern English accent so close to the border – you don’t have to go far north to find thick Scots (the accent not the people!). I had a nice moment of peace, and watched two jackdaws on a roof next to the garage, one being affectionate and the other seemingly uninterested. I realised here that if I got no further it didn’t matter and I’d already had a wonderful time. 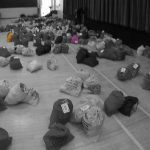 I arrived in Brampton and collected my drop bag again to get clean gloves, hat and arm warmers. I didn’t really need them but since they were there I thought it might be good to have a change of seams. I went for an hours sleep, much needed but I didn’t think I could afford any longer. On being woken (again that you volunteers, all went to plan) I felt very spaced out. I saw Osian and Louise in the cafeteria, Louise agreed that I looked like I was on another planet. I think I managed to get a couple of fried egg rolls, always a favourite riding food for me. The weather started nicely. I think caught up with Osian but went passed – can’t remember why, maybe he’d stopped. Then I caught up with Raj and we rode together for a while. He recalled the first time we met (Wiggy 300 km) and commented that he’d learned to ride rather than walk up the hills since then. A couple of guys came passed (now known to be Jon and Simon), Raj jumped on their wheel and I followed. It was a comfortable pace and they swapped around a bit at the front. Raj seemed happy where he was but for the first time ever I took part in some almost-proper group riding and took a turn on the front. I found knowing how to pace it really difficult, and they actually asked if I was happy to slow down a bit at one point. The roads started to rise and the weather got worse. 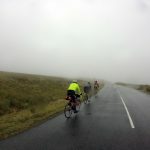 We stopped for waterproofs before the Yad Moss climb proper. 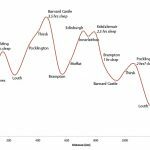 It was bleak and seemed harder than going northbound…looking at the profile the first bit by Brampton is steeper going this way, but the Alston – Middleton section is fairly symmetrical, so I expect it was more about weather and tiredness. Saw what I now know to be Drew Buck’s camper van cafe, it was one of those times when you feel like you just have to keep going so I missed the magic flapjacks. A couple of overseas riders were taking a lot of photos here and we were amazingly able to smile and wave at appropriate moments despite the relentless climbing and rain. Nearing the top (disappointIngly no sign or anything to mark it as far as I could see, it’s slightly undulating up top so never clear when you are at the summit) we stopped for extra layers to keep warm on the descent. Some time on the way down our speeds differed and our little group broke up. I stopped in Middleton-in-Teesdale (reminded of the stop here on Beyond the Dales, at which I was sorely tempted by the ‘hotel’ sign) for not one but two flapjacks in a bus shelter. Saw Wobbly’s bike parked by a cafe. 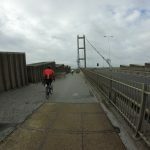 The final leg to Barney was a long slog, I was soggy and fed up. At least we had a brief glimpse of the Castle coming this way, but I was not feeling in the mood to stop for a photo, and there was quite a bit of traffic. I arrived at the control (cruelly up a steep drive) to meet Victoria on duty outside. The rain had pretty much stopped by now, so I took off my sealskin socks and wrung them out. Vic was impressed that I put them straight back on, but as I pointed out it’s better done while they are still warm. Then Wobbly arrived with a three-pack of socks he’d just bought and offered me a pair, but I was already saving a dry pair in my rack bag for some sort of final luxury. I checked in and was waiting to get food when Pete appeared and exclaimed ‘let me give you a huge hug!’, which he duly did. Any thoughts of not wanting to go back out there were banished by his joy and care, and more so when Erica came over for a chat. I knew I just had to keep going. Peter came back later and introduced me to Sue, with a preface of ‘you can tell her to go away’, and ‘I’m a skeptic but she has an amazing effect on some people’. Well I’m a skeptic too but by now also embracing all LEL had to offer. Sue is a patient (dental) of Pete’s, as far as I know she’s not a cyclist, but was voluntarily spending several days at the control doing reiki (definitely not my thing) and general life-enhancing stuff. We had a very short (under the circumstances) chat in which she taught me to tell myself that I could do this, and also dispensed many hugs. 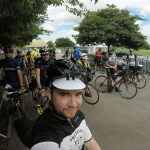 One of the more unexpected and surreal moments of the ride, but along with support from Team Davis it really helped me to go on with a positive spirit which I didn’t have when I arrived. I also met Louisa, another mini-Davis. So amazing that these three young adults would give up their time to work silly hours helping support their parents, supporting us. A last photo-op with Erica and Pete, then off. The weather was better for at least the start of this leg. 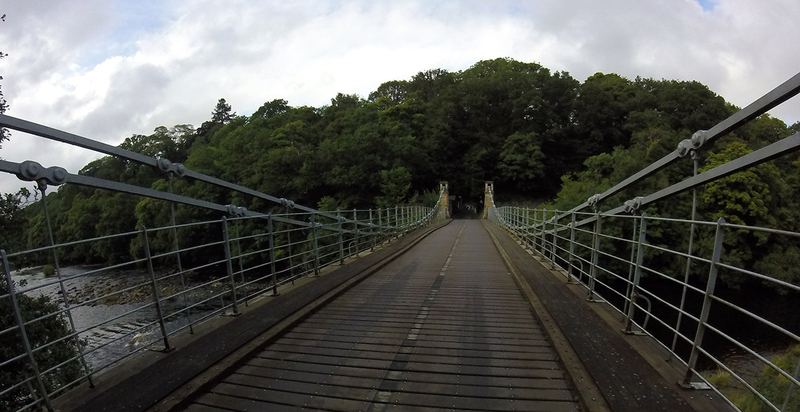 Here’s Whorlton Bridge, no chance of conserving the momentum gained on the way down. Some time before now my Achilles(es) had started hurting, first the left then both. Saddle was ok, discomfort but I’ve had worse. I was strict about cleaning with baby wipes and reapplying Conotrane at every control. I noticed that my hands were now struggling to do anything other than change gear or brake, which was pretty much all I needed them for now. Cutlery was challenging though. Numbness didn’t set in until afterwards. 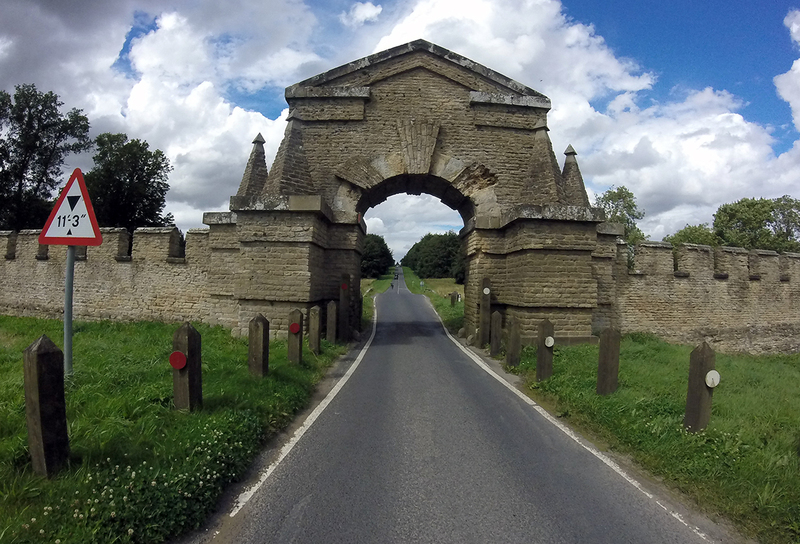 I remember riding back through Newby Wiske and there being some VC167 riders and a guy on a recumbent leapfrogging, but nothing much else. Marcus from Port Navigation was busy on entrance/exit duty outside at Thirsk and so I didn’t get chance to speak to him. I think Julian was here too on the check-in desk, we’ve done quite a few of the same rides this season, he’s a very experienced randonneur and when I’ve seen him on a ride it’s always been reassuring . 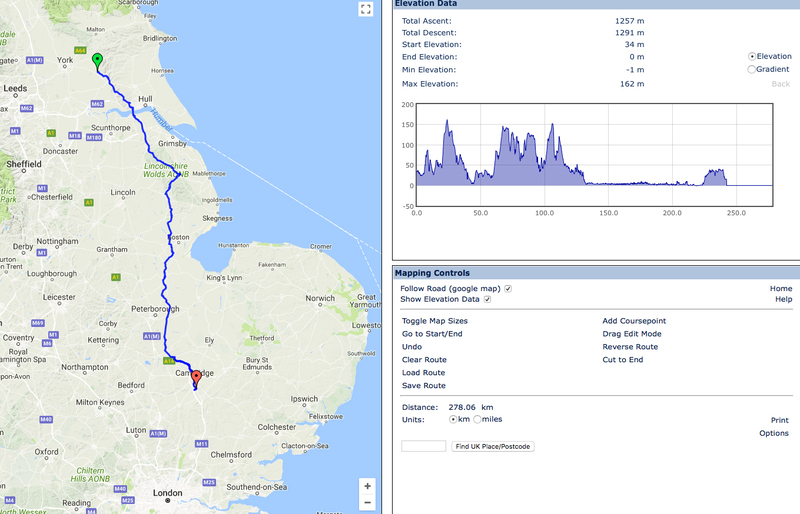 This was the 1000 km mark, but it didn’t register as I was using the route sheets which reset to 0 km at each control; I really liked this because it focussed on just getting to the next control and not being overwhelmed by the enormousness of the ride. At some point along this section it became night. I found myself with a nebulous group including some other JJ riders, and as it became properly dark and we headed towards the Howardian Hills I could reliably identify a French guy (Pascal as I found out much later) and a couple of other riders, all overseas I think: there wasn’t any conversation in either direction. I pretty much hated this bit. Riders were all over the road, not sure how much of this was sleep deprivation and how much riding on the left (there was no other traffic to act as a reminder, I tried to remember what ‘left’ was in any other language but could only manage German, and they wouldn’t have needed any help). Pascal nearly came off a couple of times falling asleep, which I found scary. I felt a responsibility but didn’t really know what to do to help; I remember asking him if he had any food. Descending in the pitch black was easier with our combined lights, so in that sense I was glad to be with others, but still I felt we were quite slow (how I could have gone any faster on my own I don’t know…). I found the roads strange…in our pool of light they looked like climbs but by cadence and gear felt like gentle descents. On arrival in Pocklington I knew I’d need a couple of hours sleep. There was a dorm across the road but it was full, so I was directed to an audax bed/the cafeteria floor. We ate quickly and Pascal and I agreed to leave in a couple of hours after some sort of sleep. I think he got a bed eventually; after some uncomfortable fidgeting I managed to find a blanket which improved the comfort and warmth of the floor by an order of magnitude. When I woke I found Osian and he joined Pascal and I when we left. I knew now that I wouldn’t be able to have another ‘proper’ sleep, it would just be a case of going as long as I could. Before now I’d felt ok for time in hand but here I started to stress about it, thinking I’d be upset if I managed to finish but was out of time. After donating some Conotrane to Raj who left very quickly, Pascal, Osian and I left together, and picked up an Irish guy whose name I’ve forgotten (sorry again). I think I chatted to team Nibbles somewhere along here too. 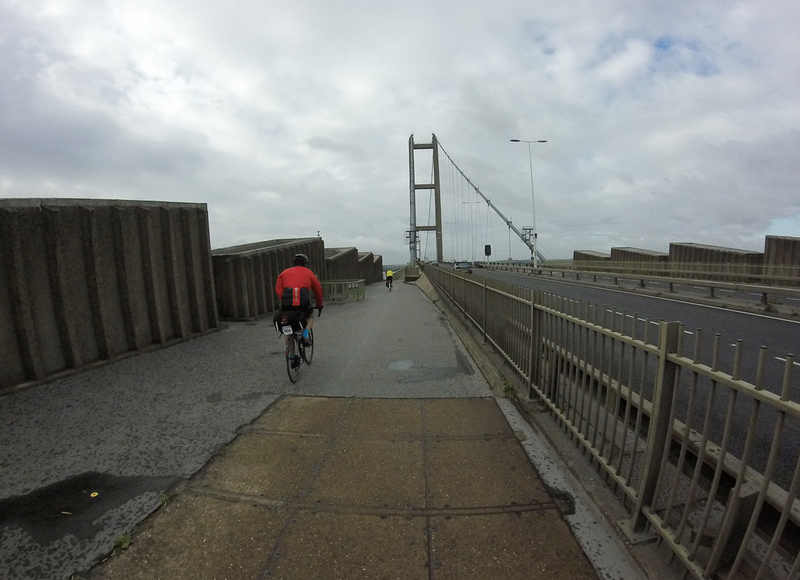 We stopped at a little shop on the north side of the Humber Bridge; Red Bull two for £2, they must have been doing a roaring trade. Over the bridge with no navigation issues this time. I can’t remember much after the bridge to Louth, I was starting to nod off so stopped at a bus shelter to find the bed already occupied – was it Rickie? – so had a sit down with my hat over my eyes, 20 mins nap which left me feeling much better afterwards. Happily Louth had some food this time, nice cheesy and veg pasta if I remember right. The chap serving said his 16-year-old son had offered to come along and volunteer at the last minute and had been in the kitchen pot-washing all night; what a star. Osian went for a sleep. 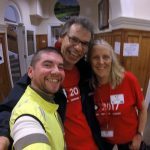 I got my drop-bag and went for a shower, bumped into Simon and Jon who gave me a towel and saved me a walk to find one. Another hideous school communal shower set-up, again I’m astounded at what we expect our young people to accept as a ‘rite of passage’*. I left with Pascal, a can of coke, and some much-appreciated campness from one of the guys on the control desk. *Not at all a complaint for LEL. Rather recalling my past memories and present identity. This was hell, and probably where it all fell apart. The wind was either head or cross, and very strong. I found riding with Pascal difficult, in retrospect he’s an experienced randonneur and perhaps I should have stuck with it. The pace felt slow, I was stressing about time and wanted to go faster. I knew I’d need to sleep again. 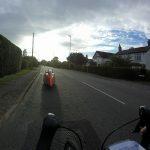 He seemed to want to set the pace in front all the time; if I took a turn on the front I’d end up pulling ahead and then wait for him to catch up, at which point he’d take the front again straight away, so I didn’t feel like I was doing my share of the work. At one point he wanted to rest so we pulled in at a bus shelter and had just dismounted when an American guy stopped and helped himself to the bench, then made some cryptic remarks about sheep…so I just had a flapjack and set off again. Goodness knows how we’d have coped if actual bus passengers had the cheek to occupy such places. Then I got into a really weird and unpleasant state of mind. Pascal stopped for a leak (I’d noticed that by this stage blokes would stop absolutely anywhere and go without lifting a leg over the top tube) and I pressed on, expecting him to catch up. 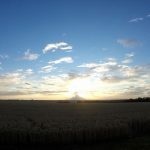 I felt very sleepy and became fixated on getting to Spalding where I’d allow myself an hour of sleep. 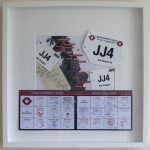 I focussed on each route sheet instruction, counting down the kms and pushing painfully on. The mental pushing here was intense, horrible, unlike I’ve known before, and I knew I couldn’t do it again during this ride. Every pedal stroke was clear yet seemed a finite resource. A few folk (including Yorkshire Nick I think) had caught up on the last few turnings and followed me as I took a wrong one, sorry. Pascal wasn’t at all far behind as we turned in to the control, he looked a bit pissed off but I just told him I had to sleep. He pretty much bounced the control; Chapeau. I had an hours sleep in the dorm and had some warped LEL-related dream. 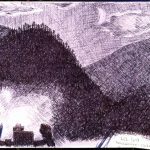 When I was woken I knew that I had to go and eat and then set off, but my understanding of what I was doing, why, and where, was disrupted. I thought I had to get back to Loughton but for the arrival of someone, maybe royalty? I knew that I was confused but it took a while to remember exactly what I was doing. I do remember a lovely volunteer telling me I was doing bloody well, and felt a bit chocked up by it. I left Spalding with about an hour in hand. Under normal circumstances I’d be confident that I could cover the remaining distance in time, but these are of course entirely abnormal circumstances. Probably I already knew then that I couldn’t finish in time. Sense of days had gone now, I think it was still darkening when I left. I enjoyed some of the first roads here; flat and sometimes following water that you’d occasionally get a glimpse of through the darkness. I think the wind had dropped, and there was a little rain. 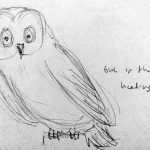 I saw an owl flying in a field next to the road, it came and perched on a fence post and looked me square in the face as I passed before taking off. I could hear crickets all the time on this section. This started to seem weird and I became convinced that either a couple of them had a attached themselves to my coat, or that it was a new noise that my bike was making heralding an imminent mechanical disaster. I brushed my shoulders a few times to see if I could get rid of them but to no effect. It got dark and I remember a string of villages I was nodding off again and stopped for a nap on a grass patch by the road. I wasn’t there long but had a very clear dream about an art teacher I had at secondary school who was a twunt. Getting ready to go again a few folk rode passed, including one guy who was playing music out of a speaker of some sort. It was very odd traveling along the dark roads with this patch of light and sound up ahead. In Cambridge I ended up following a few riders through the traffic light car-trap bit before the guided bus lane, I’d seen it online and knew to avoid it but failed miserably…at least the place was clear of traffic at this time in the morning. After a bit of faffing we found the bike lane and I pulled ahead while I could. Again, was this a mistake, should I have joined the others and would the company have kept me awake? The bike lane was lit up by permanently-on cats-eyes on either side, it was a strange experience following the two lines of lights and being able to see nothing else. Then through the centre of Cambridge, quiet at what must have been 2 or 3 am, just a few revellers. Followed the cycle route out of town and started to fall asleep again, I snapped awake and found myself in a cycle lane that I’d vaguely seen through a haze…relieved not to have come off. I knew I needed to sleep again and found a patch of grass under a tree; still urban but residential, and I was keen to make it look like my stop was intentional, not an off. I leaned the bike against the tree and lay down with bits of me in contact with it, I seemed concerned that someone might try and steal it while I slept. I don’t know how long I was there but it was light when I woke up. I’d put on my jumper and waterproof, my buff as hat and my hood up, but unsurprisingly was a bit cold on waking. I stood up and tried to decide what to do. A few riders went passed. I knew my LEL was over. I’d passed a sign to Cambridge train station a while back so initially thought I should head that way, maybe sleep in the station until I could get a train back. I was out of time, and the distance to ride to Great Easton (50 km?) and Loughton (another 50 km) seemed a long way. But others were still going and they must have been close to or out of time as well, since I was in one of the last starting groups. That convinced me to go on for a bit. 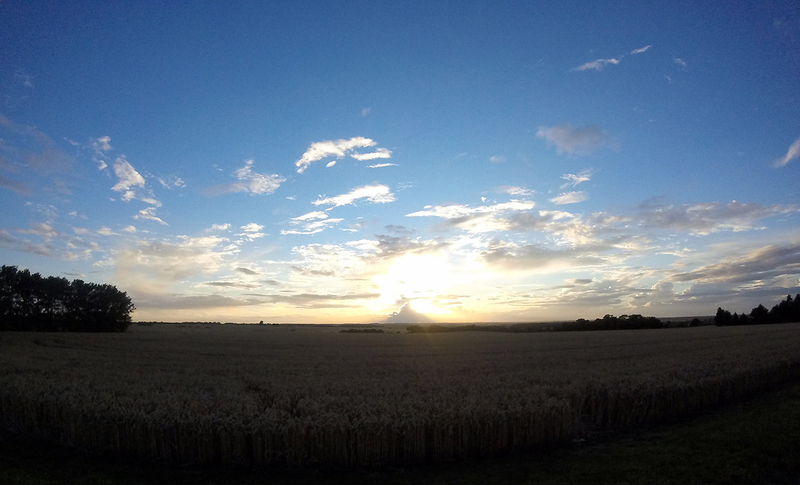 Then I changed my mind and turned back towards Cambridge. Then I stopped again, seeing more riders, and turned around again and continued in the direction of Great Easton. I’m not sure why I didn’t either try to catch someone or wait for others and have some company. But I didn’t get too much further, to Little Shelton, before I was falling asleep again and knew this was not sustainable. I powered up my phone and found there was a train station not too far back the way I’d come, which turned out to be on the Cambridge – Cheshunt line that I’d travelled down on. 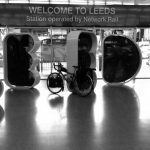 I got a train about 6.30 am, nowhere on it to prop the bike up so I had to stand next to it and was then falling asleep standing up. I remembered I had a few jelly beans left and eating them kept me conscious to Cheshunt. I got a taxi to the campsite (slept through most of the journey until the driver woke me up for directions) then got into my tent for a few hours sleep, until the morning sun made it unbearably hot. Then I got up and went for a shower, meeting Dean who’d finished and had a few hours kip at HQ. He spoke of high DNF rates and quipped ‘there’ll be an enquiry’ which provided a little comfort to my DNF. 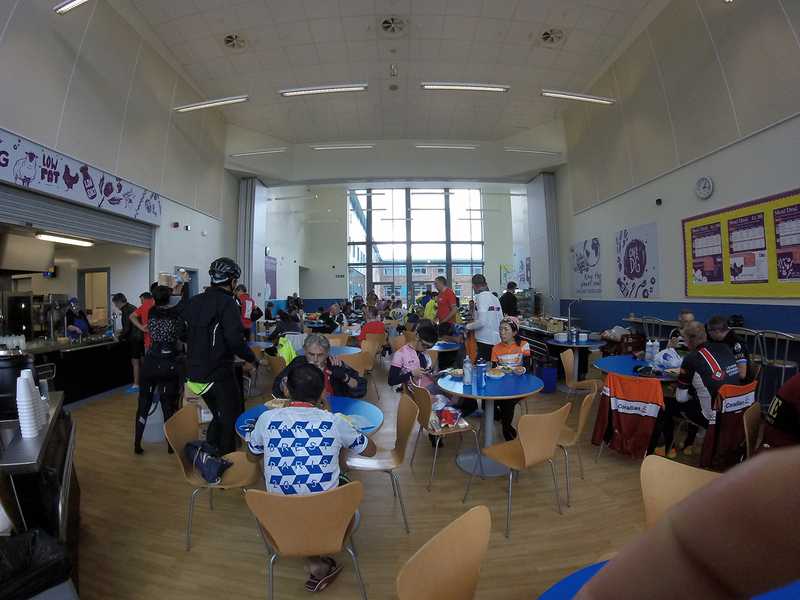 I walked down to Davenant School to collect my drop bags, and hoped I might see Raj, Osian, or the others I’d ridden with. On the way I met Chris Crossland off to find ‘some different food’. He said he’d been in Eskdalemuir when a driver arrived for the drop bags and said Chris was on the list too, so was transported back to Loughton (I hope he was allowed to sit in the cab rather than share the journey in intimate contact with full drop bags). 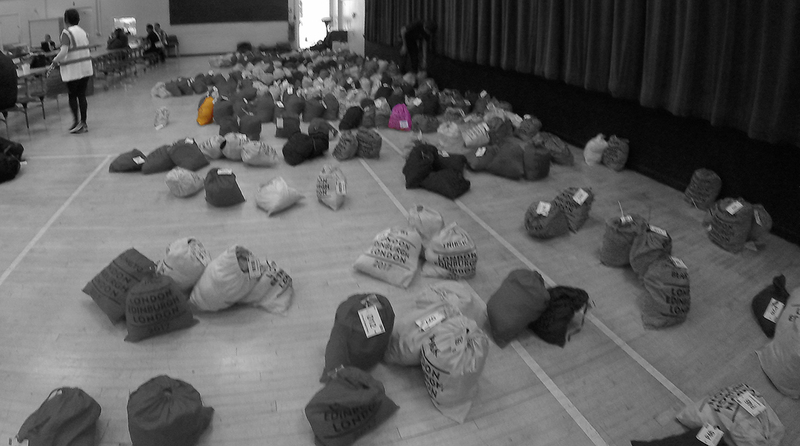 The bags were almost all there (they were still waiting for Spalding I think) and already sorted by letter. I realised I hadn’t eaten in ages and asked if they had anything, I was sent to the kitchen to help myself to potato and beans. I was defeated, but I also knew I couldn’t have gone any further. Later I went into Loughton centre and found Pascal waiting around on a bench (he said he hoped no one would think he was homeless and give him money), and we chatted for a while. He had another 1000 km+ randonee coming up and was hoping his ankle, or maybe knee, would be ok for it. I left him and bought a notepad and pen, to doodle and scribble with my defective fingers, and set up residency first in Starbucks and later Wetherspoons, until it felt like a respectable time to go to bed. It was a privilege to be a rider on LEL. Wonderful as a bike ride, but so much more. The organisation and the people who make it happen are amazing. From the volunteers who give up a week’s holiday to work ridiculous hours, to the core team who have been planning this for at least 4 years and spend day after day on our daft questions, so many people made this a success. 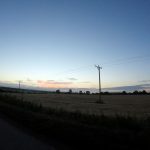 Many sections were fantastic, and I hadn’t enjoyed riding my bike for a long time; I reminded myself to appreciate them while they lasted, not knowing how far I’d get or what lay ahead: Owls hunting over the fens as dawn came on Monday morning. The tailwind allowing me to bomb along at 30 kph. 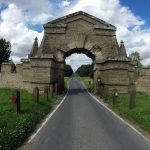 The road past Castle Howard, ridden at least once before (so I know I can do it again etc). Velvety-topped airbeds and soft blankets that will forever be the most welcoming and comfortable beds in the world. Pasta; I had been off carbs in preparation (no bonking at all and hardly any food not at controls, I’m marking that down as a success). Yad Moss going north with drawn breaking. Friends at Barnard Castle. The familiarity of Lockerbie Tesco in such unusual circumstances. Chatting to Maryjane about Hewitts and being technicians. Talking to the guy with the union jack tights in the dark. 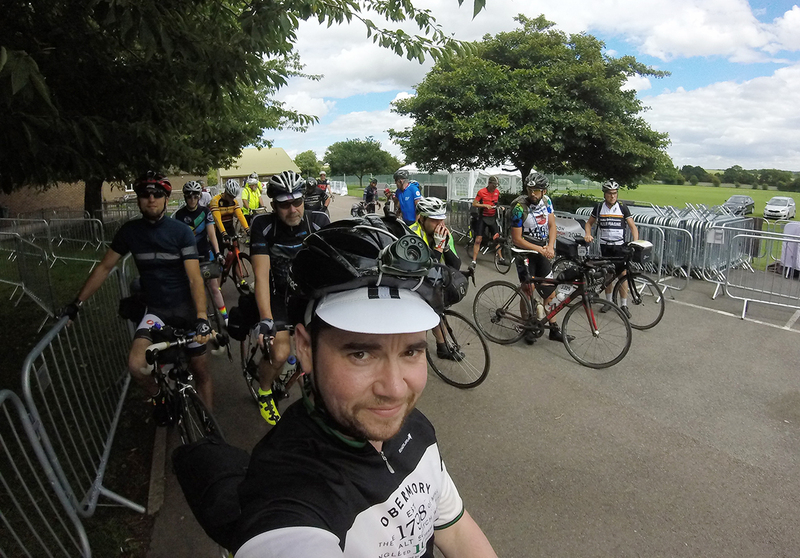 Ending up in a Yorkshire peloton for a while. 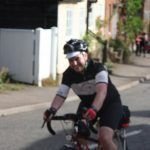 Climbing the Beeftub – eventually by bike. 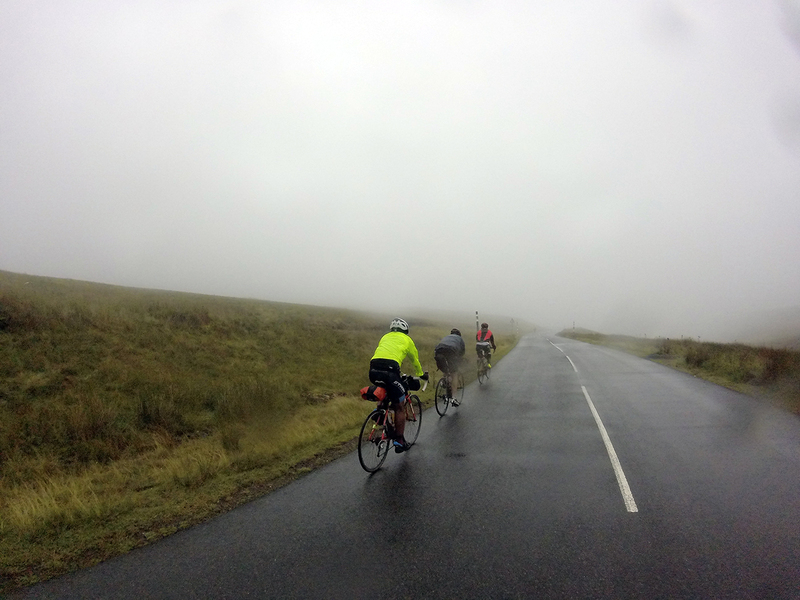 The descent afterwards – you could freewheel for ever. 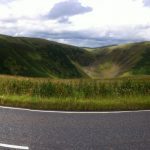 Edinburgh to Innerleithen; beautiful hills and deserted roads. Seeing familiar faces: Dave in Edinburgh, Lucy in Innerleithen, Chris everywhere. 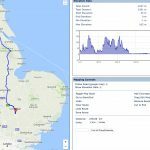 Having been unsuccessful on my 600 km rides I was lacking experience in sleep management and this is what did for me in the end. I need to – either or both – ride faster, and spend less time in controls. Or be able to stay awake for longer, but I suspect that is largely pre-determined by biology. An advantage(!) 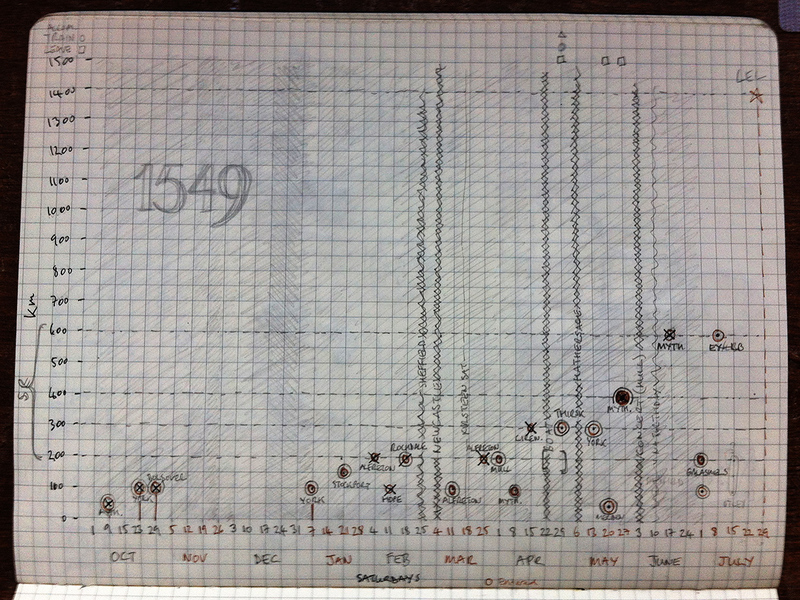 of DNFing is that I kept my brevet card with the arrival times on, so I already have my ‘time in hand’ graph. I didn’t hurry through controls, but being after the bulge I also didn’t have to wait around much for anything. So while I could have been quicker with the water/bogs/food routine I can also see that under different circumstances (more queues) I could easily have spent the same amount of time stopped just because of waiting for stuff. Which suggests I would benefit from riding faster. I think this means nasty things like ‘interval training’. I was really pleased with myself managing to stick to the philosophy of ‘just focus on the next control’ (at times only the next routesheet instruction). 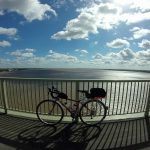 I think the distance being so much further than I had gone before, and my capability unknown, made this easier; getting to the next control was often all I could expect myself to do so there was no point in worrying about the rest of the ride. I’d definitely go for a late start time again. As noted elsewhere you will pass more people than you’ll be passed by, which is psychologically helpful. The bulge is avoided. 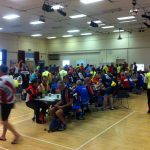 Given the current knowledge, experience and awesomeness of the organisers you are unlikely to get to a control that has run out of food. The only thing is that if you are out of time but still going the controls might be closed; if you’re out of time but an earlier starter you still get all the benefits of the controls which are open for the later folk. I rode on my Hewitt Cheviot tourer, which is my ‘good’ bike. I got it for touring with audax at the back of my mind. 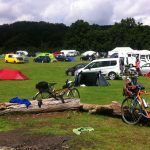 No doubt it’s not optimal, but people rode LEL on Bromptons, a mountain bike, a Pashley, several fixed, plus recumbents both two-wheeled-and-naked, and three-(and even four)-wheeled and fully-faired. And that funny tringle-shaped thing. It really is not about the bike. I’ve been doing all my own maintenance this last year or so, many thanks to my local community workshop Pedallers Arms. The only thing I didn’t mange to do that I wanted to before LEL was replace all the cables. Nevertheless my bike did everything I asked of it, and I had no mechanical issues. I think my position could be improved, and a bike fit might be a birthday present to myself in the future. I thought I might hate my bike and all that is cycling after LEL, but it’s been quite the opposite. It’s now waiting for new cables and headset bearings, not to mention a good clean. It gets a pat on the handle bars everytime I walk past it on my way out of the shed. Two weeks post-LEL (no cycling): Achilles pain has pretty much gone now although ankles are still slightly stiff. Always worse in the mornings. A little numbness in toes, one or two on my left foot occasionally slightly painful. I’ve been most conscious of my hands, all of my fingers are slightly numb but my left hand is noticeably worse and my thumb and forefinger are sometimes not bending when they should. Strength is limited, not sure if this is real or due to a lack of feedback from the numbness. But I have managed to write (messily) and then type this. Mentally I’ve been in such a different place compared to the months before LEL. Perhaps it’s a human equivalent of ‘have you tried turning it off and on again?’ I felt such clarity on the first couple of days of riding that I haven’t had for a long time. A friend asked me a while ago, ‘what do you think about for all those hours riding?’, and for me the beauty is that I don’t really. It’s simplicity, like when I’ve been touring, except more intense and immediate. I have to follow these instructions to get to the next place where I can eat and maybe sleep; I have enough with me to keep just about warm and dry. 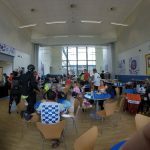 I had connections with people in a way I don’t normally, volunteers and riders, so much is stripped away and we all just get on with what we have to do, all the time looking out for each other. I’ve made an effort to hold on to everything and process it all rather than avoiding anything, so I’m not beating myself up about not finishing; I don’t regret stopping when I did, because I could not go any further. I am happy to question myself and answer myself on this. I’ve ordered a jersey and I will wear it with pride, cos I damn well earned it. Recently someone on FB defined DNF as ‘did not fail’. I’ll go with that. 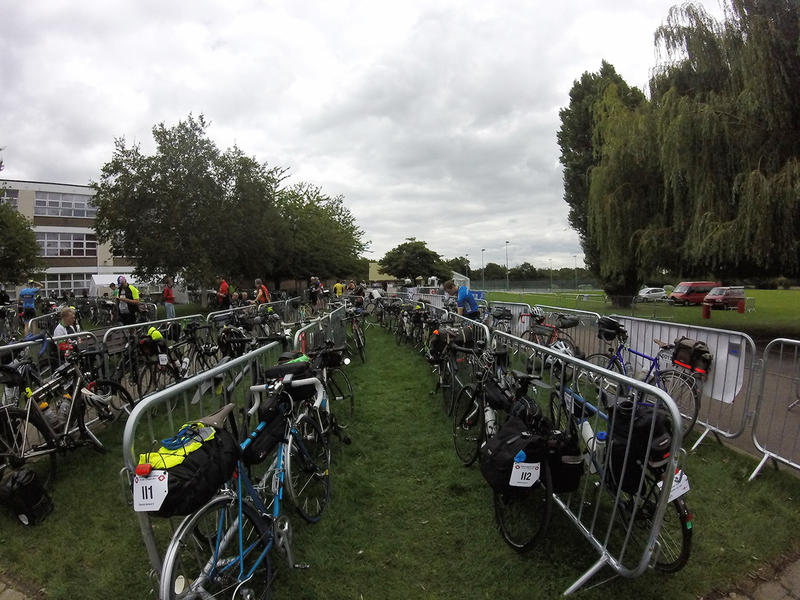 …was how the organiser described ‘riding the route by shortest distance’. Because those extra 47 km to ride the route proper will make it a perfectly normal and pleasant experience. 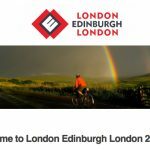 I have entered London-Edinburgh-London; rider 5817. So far my longest ride has been a 200 km. I volunteered on Windsor-Chester-Windsor in 2015 which was not only a great experience in itself (why don’t I have a blog post about it?) but also rewarded me with a guaranteed place on LEL. Although since I’m an AUK member I would have had one anyway, but it felt extra-specially guaranteed. 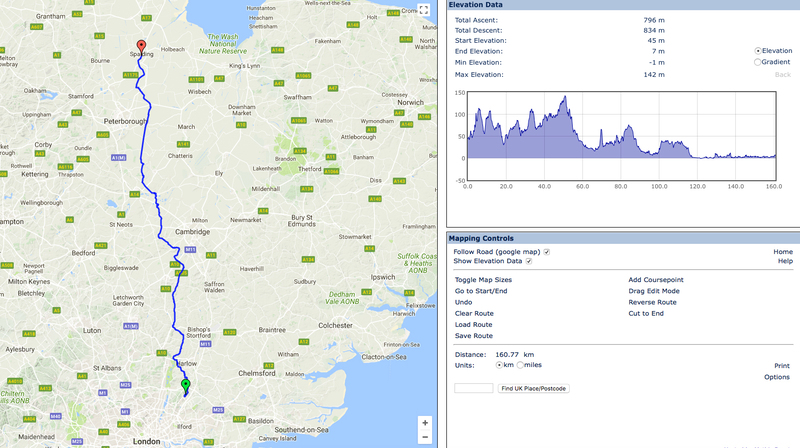 I have a plan, I’ve entered as many audaxes in advance as possible to build up to hopefully two 600 kms in June, and an SR series too all being well. 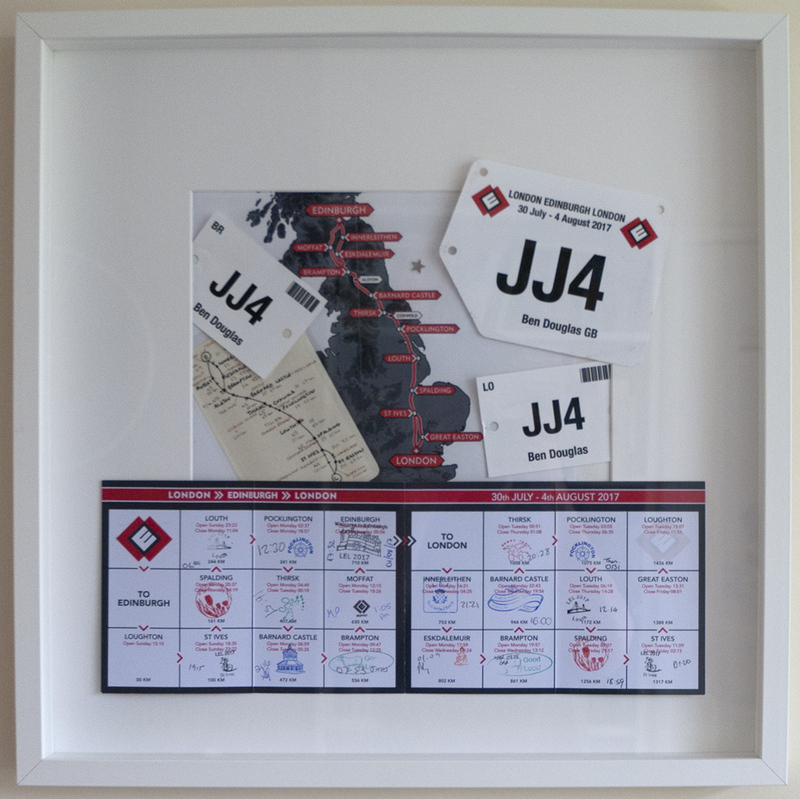 It will be my 40th birthday this year so I decided to mark it by doing this, and putting the remaining surgeries that I am waiting for on hold, as they will keep me off the bike for some time. As a consequence, future posts might include such exciting details as schedules, food, how much I weight, etc. This is to aid my preparation and not because I am under the illusion that these things are in any way interesting. If it gets really bad I’ll include details of sudocrem applications.